The stories of fairies and where they come from are as old and diverse as any tale ever told. In most stories, fairies are tiny little creatures with wings. They are known to have magical powers and to be very helpful. In general they love to dance and sing. There are many different types of fairies and they have just as many personalities. They live in all kinds of places, so be sure to know your faeries. And remember the next time you see something out of the corner of your eye or you hear strange long ago music, that you've probably been visited by a fairy. Have you seen a Horse Fairy? They're anywhere and everywhere that you find a horse that is loved. Why, there's one now - over there- standing next to your horse! What's that? You haven't heard of horse fairies? Well pull up a chair, and listen to some marvelous tales of horse fairies, and the horses they serve. Horse fairies are to horses what guardian angels are to people. 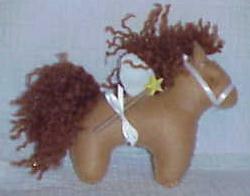 Horse fairies offer guidance, protection, and comfort. Your horse can see them. Hear them. Even play with them. Each horse, upon finding his human soul mate, has a fairy assigned to him. Compatibility is taken into account, so that each horse's fairy will be able to compliment him. For instance, say your horse is the curious type, and as a consequence, finds himself getting into scrapes. He's going to need a horse fairy that can tell him how to avoid getting tangled up in fences, or tell him which plants not to taste test. The important thing that our horse fairies do, is to visit our horses at night and review the lessons of that day. They help the horses to overcome any stumbling blocks in the lessons and help them understand what it is they need to know.